Chemical Weapons Claims Spur Calls For Force Against Syria : The Two-Way Opposition forces say chemical weapons deployed by the Assad regime killed scores of people on Wednesday. The regime rejects that charge. The claim has some diplomats warning that it may be time for other nations to step in militarily. 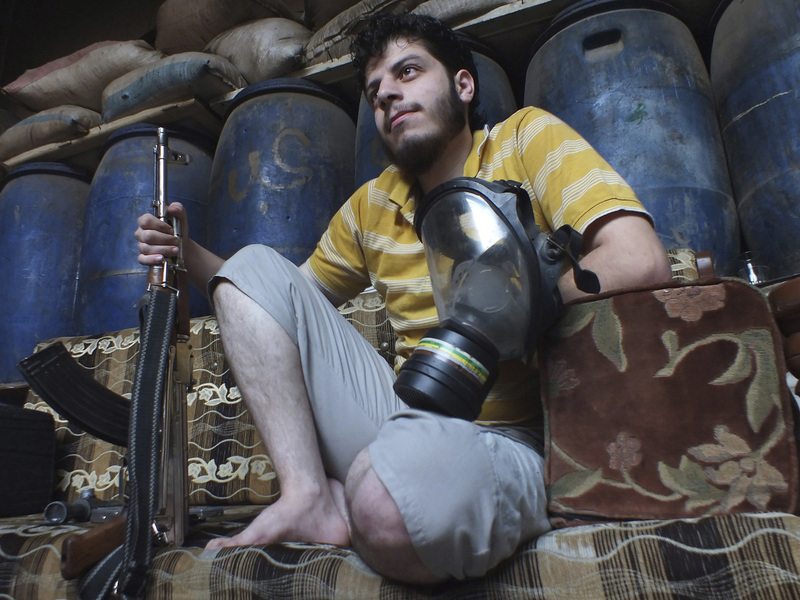 Gas mask in one hand and rifle in the other, a Free Syrian Army fighter sits inside a house in the city of Homs early Thursday. -- Turkish Foreign Minister Ahmet Davutoglu is also urging that action be taken "to prevent further chemical strikes." (The Wall Street Journal) "This event is one that cannot be ignored anymore," Mr. Davutoglu said. Still, as the BBC's Nick Bryant reports, "meeting in emergency session, the United Nations Security Council failed to reach an agreement on a toughly worded statement condemning the alleged atrocity in Damascus. ... Once again we saw the usual divisions between the Russians and the Chinese on one hand and the Americans, the British, the French on the other." The Assad regime rejects the allegations about use of chemical weapons. There have been countercharges that opposition forces might have deployed such weapons or staged the videos that popped up Wednesday on the Web — videos showing scores of people who were allegedly victims of a chemical attack. United Nations inspectors are now in Syria to investigate earlier reports about the use of chemical weapons, and the regime alleges that the opposition is trying to influence those inspectors. On Morning Edition, Financial Times correspondent Abigail Fielding-Smith reported from Beirut that "my gut reaction and the reaction of most of the analysts I've spoken to is that ... these videos — there are simply too many of them, and too many of them involve children who ... I don't see how they could be coached to act [out] those kinds of things. ... It just seems highly implausible that the entire kind of range of symptoms that we've seen and people in distress are some kind of movie." Meanwhile, The Associated Press reports that Assad's forces "pressed on with a military offensive in eastern Damascus on Thursday, bombing rebel-held suburbs where the opposition said a chemical weapons attack the day before killed over 100 people." "At this time we are unable to conclusively determine chemical weapon use," State Department spokeswoman Jen Psaki told reporters Thursday afternoon. "We are focused on doing everything possible within our power to nail down the facts." NPR's Michele Kelemen reports that the U.S. is calling on Syria to allow United Nations inspectors to visit the site of the alleged chemical weapons attack. State Department spokesperson Jen Psaki says Secretary of State John Kerry has been working the phones and President Obama has asked the intelligence community to do what it can to determine the facts. "At this time, right now, we are not able to conclusively determine chemical weapons use, but we are focused every minute of every day since these events happened yesterday on doing everything possible within our power to nail down the facts," Psaki says.